You Are an Abundant Babe : Skyrocket Your Self-Belief, Integrate the Secrets to Success, and Tap Into the Abundance That Is Meant for You. You totally manifested this book. It is no coincidence you find yourself here reading this book description #synchronicity. You are being called to a higher purpose. You are being pulled towards creating that life you know deep down you are truly capable of. You desire growth and success, and you're trying to figure out how to make it all happen. But, how do you overcome the self-doubt? How do you create "ease," and wtf even is that anyway?! How do you unlock what you know deep down is possible for yourself? I totally get it. Like me, you're also a super ambitious babe with a desire to make a massive impact on the world. You're soulful, kind, caring, and have that little voice inside of you reminding you of all the epicness you are capable of. How do I know? Because I was just like you! In a short handful of years I went from being overwhelmed, full of fear, and not really sure how to navigate through life and entrepreneurship, to launching and building an ever-growing coaching business, traveling the world with my husband full-time as a digital nomad, and having a successful podcast (Abundant Babes). I have been through the grief of losing a parent, suffering from victimhood and a host of mental health issues, over six-figures in debt, and so much heartache. These days I live with more joy than I ever thought possible, I am successful as a woman entrepreneur, I inspire oodles of people, having the most loving and amazing relationship, and most powerfully, I change and transform peoples lives. I reflected on my journey and what it took to get from my personal lows to the life I live now. I identified key components to upping my self-belief, really integrating and applying my "secrets to success," and tapping into the abundance that I am designed for. ▴ All wrapped up in a ton of fun conversation, the "real me" voice (#sorrynotsorry for the swearing and use of ironic hashtags throughout the book), and lots of humor - if you get my style! ▴ The KEY to this book is integration - I don't want you to just read it and get inspired, I want you to apply what you learn, and see the success you desire. For this reason, every chapter has "soul work" and journaling pages. I've also have resources to help with the integration of the book, which can be found at violahug.com > book. 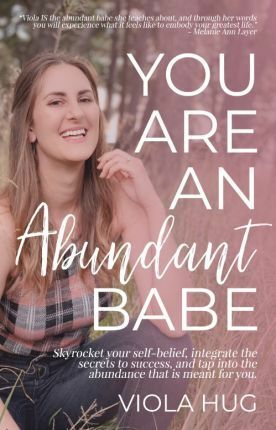 All in all, YOU ARE AN ABUNDANT BABE is a deep dive into all you need to know to move past your own BS and start living the truly abundant life you are meant for. Throughout this interactive book, I, Viola Hug, Intuitive Coach & Mentor, will help you understand where you have been held back by your beliefs, ego, and conditioning, and guide you with stories and subtle shifts that will finally allow you to fully step into your power, truly believe in yourself, and have the courage to create an unapologetically abundant life. As one client so beautifully & simply said: "Viola will bring a whole other level to your life that you didn't even know was possible."